The REFINERY has been working closely with the Stephen Lawrence Centre in Deptford on several fine-art projects designed to create new public works of art, and place the SLC at the centre of the local community. Stephen Lawrence was a promising young student who dreamed of being an architect, but those hopes were dashed when he was cruelly murdered in a racially motivated attack in 1993. His mother, Doreen, became a great campaigner for social justice, and her dreams of creating a lasting legacy for her son Stephen were realised with the opening of the Stephen Lawrence Centre in Deptford in 2008. Designed by internationally renowned architect, David Adjaye, the aim now is to place the physical building at the heart of the community, and The REFINERY is helping to do this through the public art projects its is involved in. 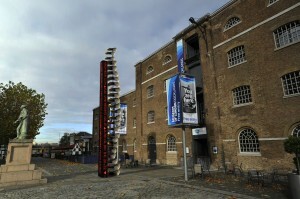 One of these projects was also carried out in collaboration with The Museum of London Docklands, in which participants created a model of a new public artwork to stand outside the museum at West India Quay. The Fourth Plinth project in Trafalgar Square continues to be a resounding success, enabling the creation and public enjoyment of continually renewing works of art. Last year, the Museum of London Docklands, and the Stephen Lawrence Charitable Trust joined forces in a project which took its lead from the Fourth Plinth concept, but addressed a plinth that was closer to home for them. 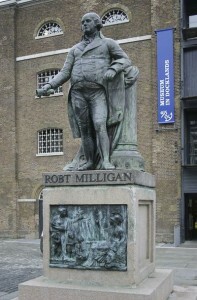 Outside the Museum of London Docklands on West India Quay in the heart of what is now London’s new financial district, stand a grand 19th century granite plinth upon which is perched a statue of 18th Century sugar trader, Robert Milligan. His family were rich plantation owners, and, concerned with commercial losses they were seeing during the import of sugar to a disorganised London dock system, put forward a great deal of money to found the first formal warehouses that would form the heart of the 19th century London Docks. Although he was not known as a slave trader directly, it goes without saying that he and his family made use of the slavery system to provide a workforce on their plantations. As such, asked the Museum of London – regardless of his input to the building of the docks, is he really the right person to be surveying today’s Docklands from his elevated plinth-top position? Whether you like it or not, in a way its appropriate. He would no doubt approve of the gargantuan edifices that pay tribute to Mammon whose pinnacles cast a shadow over Canary Wharf today. Like Milligan who built his wealth on the back of those in poverty (slaves and dockworkers), the towers of Canary Wharf today are home to the bankers and businesses who lay claim to the lie of continual global economic growth and reward themselves with fat bonuses (6 million to the chairman of Barclays?) even though they have brought the world to its knees in a recession of their making. There are a few less risk-takers in the towers since Lehman Brothers sacrificed itself, but make no mistake, the rest are carrying on regardless. But back to the project. My contribution, a canvas based on photoshop images collected and collated during the course of artistic development replaces the plinth with twin towers. 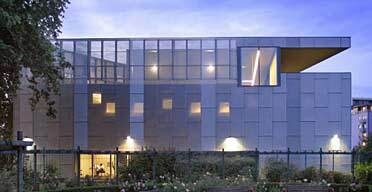 The first is a two storey high spine in bronze. The second is an architectural needle with two scrolling digital surfaces. The first gives bankers the updates on the current stocks and shares. The second reads a constant scrolling phrase taken directly from an original 1892 ledger for the West India Co, to be found nestling deep in the archive store. It was found in the back pages of the book and documents the fate of workers who have been taken off the payroll. The average age was 37. It reads “DECEASED, DECEASED, DISABLED, DISMISSED, RESIGNED, DECEASED, DISMISSED”, a sobering epitaph for the dockworkers of the day.